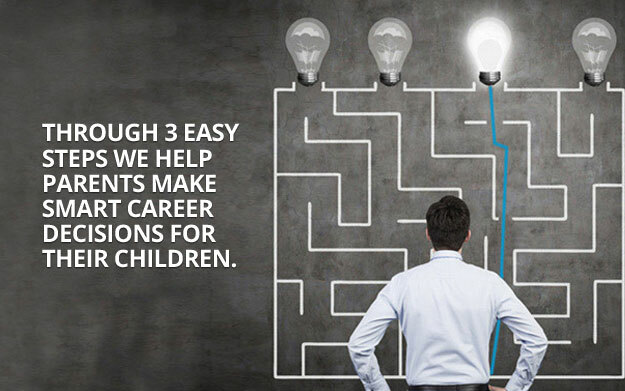 Through 3 easy steps we help parents make smart career decisions for their children. "The overall experience of Lodestar Career Guidance program was amazing. All our queries were answered without any hesitation. The counselor who guided us throughout the program was very enthusiastic . I would surely recommend about Lodestar to other parents." "Thank you Lodestar for the great career guidance program. We had earlier attended such types of programs, but your career guidance program is truly exceptional and very informative. The approach quality and guiding capability of your counselor is really appreciable. Furthermore, data collected by your research team are informative. Overall the experience with your program was very good!" "I'm really happy with the solution offered by Lodestar. With exposure to over 250 careers and a comprehensive career plan from career to college, they have truly enabled us to make a smart career decision for our child." "We were clueless in terms of the currently available study choices, career options and the opportunities those careers could provide in monetary and lifestyle terms. Lodestar Career Guidance program could provide plethora of information in a structured manner enabling us to take appropriate decisions. The interaction with the career guidance specialist serves as a second opinion for the student thereby reducing parental pressure and biases towards the task of identifying right career." "The overall experience with Lodestar was very good. The program provided a range of options open for my daughter Kristina, and more over helped her to decide the way forward. It gave us a better understanding of the number of opportunities available with different study programs. An exceptional program recommended to all students who are yet to firm up their career choices." "The Lodestar Career Guidance Program was very useful for me and my daughter, Arpitha. The information about occupations and colleges were insightful. The counselor who conducted the sessions for us was very helpful. Please continue this program!" At Lodestar, we believe that a child must discover their true career path for a bright future. In just 3 sessions, we uncover and set the course for your child's true career path. What is a true career path? 1)	Speaks to a child's passions - A career that does not connect with a child's passions will affect their performance in the long term. A career that is in line with a child's passions will motivate them to excel every step of the way.For example, a child might be passionate about languages. A career in finance may not motivate them to give it their 100%. 2) Aligns with their strengths - It is important that a child choose a career that matches their strengths. For example, a child may be interested in a career aerospace. However, their poor aptitude for science or mathematics may limit the success they might be able to achieve. A scientific approach:Scientific tests and a complex algorithm to uncover a child's true potential and match their passion and strengths to the right career and education path. Exploring 250+ career options: All researched and converted into guide books validated by industry practitioners. Authentic data: On 200+ colleges, 100+ exams, 100+ special courses, and 15 of India's best tutorials. Individual attention: Every child gets 3 one-to-one sessions to find a true career path. End-to-end decisions: From career, stream and electives to exams, tutorials and college.